2019 Yamaha Grizzly 90 Youth ATVIntroducing the all-new Yamaha Grizzly 90 youth ATV! Combining Proven Off-Road performance and versatility with a fun, confidence-inspiring 90cc engine and CVT transmission for entry-level riders 10-years-old and up. 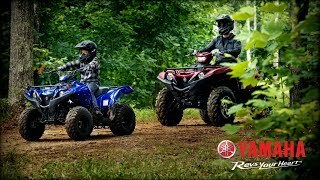 SUBSCRIBE to "Yamaha Motor USA" on YouTube: Yamaha Utility ATV Models: Yamaha Utility ATV Current Offers: Follow us on: Instagram Twitter Facebook Pinterest Life can have many exciting, memorable experiences. Creating opportunities for them is what Yamaha is all about.